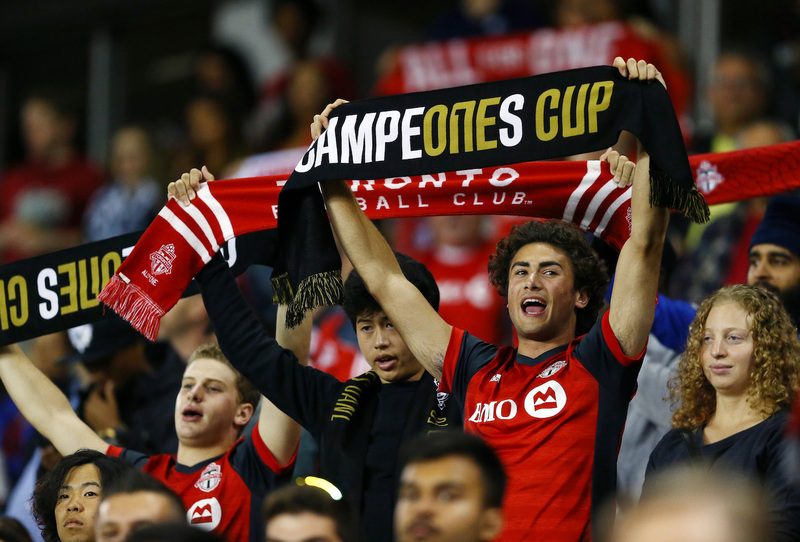 Last week BMO Field in Toronto, Ontario, hosted the inaugural Campeones Cup, a winner-take-all match to crown the absolute champion of North American soccer. Pitting the champion of MLS and the champion of Liga MX, the match was between Toronto FC and Tigres UANL. Tigres won an intense game 3–1. For the respective leagues, the hope is that as the event grows, it will create a healthy rivalry between countries on the soccer field and enhance player development and interest in the game across Canada, the U.S., and Mexico. It’s all part of a larger initiative to bring fans together in a show of unity while fueling a rivalry between the leagues. Though the match was on a Wednesday and had an 8:15 p.m. start, there’s no doubt the event can be considered a success. Fans traveled from Mexico, and Tigres supporters occupied the north-end stands, sounding their horns and chanting their support. In the south end, TFC fans banged their drums and stood cheering and creating a unique atmosphere. It might have been a school night, but there were kids at the game! Max, who is 10 years old, traveled over an hour to see the game. “I’m a big TFC fan, and I come to almost every game,” he said. Carlie, 14, was there celebrating her birthday with her parents, younger sister, and brother. She was hoping to “see TFC win the Cup,” and while that didn’t happen, maybe she saw something bigger. Maybe she saw the start of something that will become an immensely popular event for soccer fans all across North America! 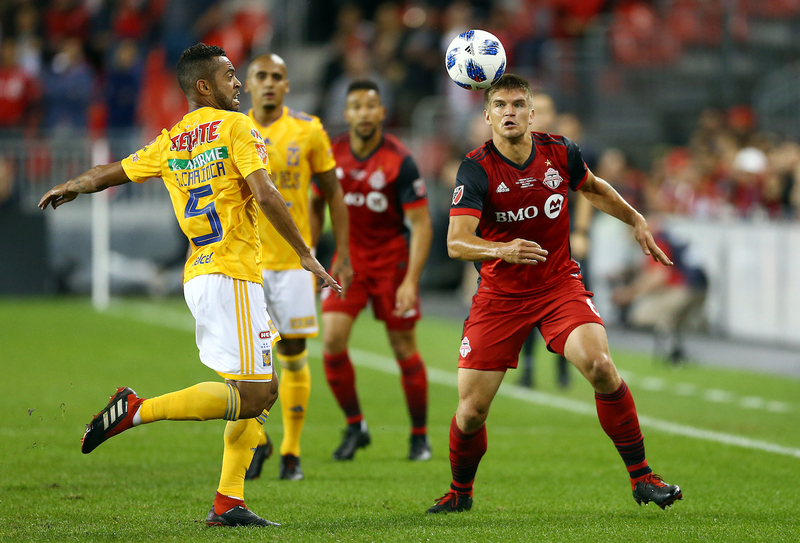 The game was a rematch of the CONCACAF Champions League quarterfinals in March, in which TFC defeated Tigres on aggregate goals and were able to move on to the semi-final round. The road to the Campeones Cup was not easy, as the teams had to win their respective leagues. TFC had a marvelous year in 2017, setting a new MLS league record with 69 points during the regular season and winning their first ever Supporters Shield. Then, avenging their ’16 loss in the MLS Cup final, they defeated the Seattle Sounders to win the ’17 Cup. Tigres, after finishing second in the regular-season standings, defeated Monterrey 3–2 to win their title. They then earned their place in the Campeones Cup by defeating Santos Laguna, the Clausura Campion, in a battle of the Mexican league champions. With TFC having a tough MLS season in 2018 compared to last (they are in ninth place in the Eastern Conference with five games to play), the message coming from the team ahead of the match was that this would spur them on to a strong finish to the regular season in their push to make the playoffs. For the first 15 minutes of the first half, TFC led a strong attack, keeping the play in Tigres’ end. The pressure began to change shortly after with Tigres controlling more of the play, but at the 31-minute mark, Jay Chapman of TFC had a great scoring chance that just missed off the crossbar. The momentum was short-lived, as at the 35-minute mark, Jesús Dueñas of Tigres got the first goal in Campeones Cup history to give his team a 1–0 lead going into halftime. The second half grew more intense, with TFC trying to apply pressure and get the equalizer, but Tigres scored their second goal in the 63rd minute, then added another in the 65th when TFC accidentally knocked in an own goal. Despite Lucas Janson scoring a late penalty-kick goal, Tigres came out victorious in the inaugural Campeones Cup.